Top 5 Ways To Keep Kids Active All Summer Long - Energetic Juniors - Contact Us! Did the last day of school spring up on you out of nowhere!? Now the kids are home all day, and all they want to do is park themselves on the couch, watch TV, and play video games. Yet they still need to get the recommended daily exercise and experience those physical benefits. How can you get them excited to get moving without making it feel like gym class or a chore? The trick is to meet them on their level. Each child is unique and has their own interests, so we have to find activities that speak to them. Here are a few ideas for how to tap into their interests and get them moving! Check Out What’s Happening in Your Neighborhood! There are an infinite amount of sources out there on the web, but I highly recommend checking out sources such as Timeout.com and DNAinfo.com. Both of these (and countless other sites) will update their calendars with local events and fitness-focused activities catered to kids. TimeOut will often list the best parks or local festivals taking place in your area. Playgrounds are an imaginative space for kids of all ages (yes, adults can be big kids, too); taking your child to the playground allows you to see their strength grow in the most natural of environments. Get Sports-Specific Personal Training for Kids and Teens! Just because sports leagues for the school year have finished doesn’t mean your child should lay off training: pre-season conditioning and tryouts are just around the corner. By training for individual sports, they will come back in the fall stronger and better prepared, which coaches will certainly take notice of. Personal training for kids provides individual attention and can lead to seeing visible improvement faster. Kids’ trainers can give coaching tips and techniques to enhance their athletic performance and target their strengths and weakness. Sports-specific training is the most effective method of training for youth athletes. Companies such as Energetic Juniors match kids with seasoned youth trainers. The fitness industry is bursting at the seams with fitness challenges ranging from walking 10,000 steps a day, to drinking a gallon of water, to even yoga pose challenges. Discuss with your child what sort of challenges they would like to complete. It doesn’t have to be one found on Instagram, though that can be a great source of inspiration. Coming up with some on their own will make them feel more committed and likely to follow through with it. A good starting point may be steps challenges accomplished by long walks to a fun destination, basketball shots, making a list of different parks to explore in city, or even star jumps which can be done at home. The options are endless and with a challenge you can always find ways to top them! Perhaps because school is out, some of your child’s best friends are away at sleep-away camp or spending the break out of city, and they feel like they can’t have any fun without them. However, unlike adults who may find making new friends more of a challenge, kids more often than not will quickly find common ground with someone. Luckily we live in a vibrant city where there are plenty of day-camp options that have specialty focuses such as: Musical Theatre (http://www.broadwayboundkids.net/), Tennis (http://www.gothamtennis.com/summercamp.html), Tech (https://www.idtech.com/kids/tech-camps/) and Cooking (http://tastebudskitchen.com/). Find a day camp that speaks to their unique interests, and the exercise for your child will follow. Some of my best memories as a kid were of early morning bike rides in the park with my dad. Not only were he and I getting in some solid exercise early in the day, but it was a chance for us to spend some quality time together. Your child will remember the time spent bonding and the example of a healthy lifestyle being set rather than thinking of the importance of exercise. As an added bonus you can check off your own thirty-minute cardio requirement for the day! The summer opens up numerous activities that might not otherwise be available year round depending upon where you live such as swimming, kayaking, and rowing. Even utilizing many of the current apps such as Map My Run can be a measuring tool that you and your child can use as visual inspiration. It doesn’t really matter what the activity is so long as you are doing it together. When the summer comes to an end—and it always comes sooner than we imagine it will—, it is important that your kids have some impressionable memories to walk away with. The older kids get, the more distractions they have, and the more likely they are to begin to lose interest in physical activity; but those who’ve enjoyed exercise from a young age are more likely to stay active into adulthood (kidshealth.org, 2016). 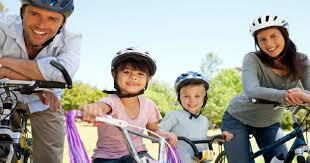 It is recommended that children get at least one hour of physical activity a day. Kids do not need to go to the gym and target different muscle groups throughout the week like adults may do: they are naturally going to use their entire bodies and physical strength; so this is not say at the end of the day they can’t kick back and play some video games on the couch; it is summer vacation after all! So see what’s happening in your city, try new activities, and challenge them to discover what they’re capable of. This will be a summer they won’t forget. By Laura Young, a certified ISSA Personal Trainer and ISSA Youth Trainer, and a registered yoga teacher from Atmananda Yoga in Manhattan.